Charley's War: The End- BLOOD FOR THE BARON!!! Just got back to the FOB and the final volume of Charley's War arrived this afternoon. Verily doth the old order passeth. I haven't got around to getting any yet, but I'm hanging to read. Nice. Just out of interest, does it end after the Russian Front in 1919, or do the books include Charlie's experience in 1940 France leading up to Dunkirk. Personally, though not as good as the 'trench' era Charlie's War, I think the WWII effort was a valiant attempt in a post-Mills paradigm! I actually liked (and continue to like) it. Fired up some char and read last night. Had a few flashbacks to reading them in the first instance nearly thirty years ago in the process. Great intro, superb scans (yet again - last few volumes have been excellent, now a little hard to know where the limited amounts of original art in the more recent volumes ended and the scanning continued), and amidst a slightly predictable coda from Mr. Mills some very interesting news. Hopper wrote: Nice. Just out of interest, does it end after the Russian Front in 1919, or do the books include Charlie's experience in 1940 France leading up to Dunkirk. Indeed, just after the Russian Civil War. Charley's then on the dole and meets Old Bill and they go for a drink ... just as Hitler's elected Chancellor. Hopper wrote: Personally, though not as good as the 'trench' era Charlie's War, I think the WWII effort was a valiant attempt in a post-Mills paradigm! I actually liked (and continue to like) it. Chopper wrote: Same here, Hopper. Yeah, it doesn't exactly romanticise the Phoney War and the mess the BEF got into. Mills wanted to go further into interviewing vets and subvert the mythology of WW2 in the same way as WW1, he elaborates a little more in the coda. The villian would be Churchill. However, to do that you need to explain why Churchill was against the establishment faction who wanted peace with the Reich, not least the recent drip-drip-drip of info confirming Hess' mission on Hitler's behalf to get Lord Halifax-Duke of Windsor et. al. in line behind the Reich pre-Barbarossa in return for the Empire remaining intact. Hence his permanent and very weird incarceration in Spandau (guards could not make eye contact with him, but had to follow him everywhere). Similarly Roosevelt subverted the same faction in the States, Prescott Bush et. al., who still managed to trade with the enemy thereafter in a more limited fashion (Ford, IBM etc.). As for other myths, the clean war in the desert etc., they were cast aside years twenty or more years ago. I would like to see Charleys WW2 exploits perhaps collected in a Garth Ennis Presents Battle Classics volume-(The HMS Nightshade hardback is excellent) I doubt that' will happen seeing as he stopped reading it around that time-but worth reprinting just for Joe's Artwork-no one has drawn the evacuation of Dunkirk quite as masterly as him. .. if they did do another volume maybe chuck in some Soldier Sharp Rat of Rifles in their for good measure. I agree. It needs to be reprinted as well as a homage to Joe's dedication and skill. Incredible atmosphere in that comic, just incredible. In a sea of gung-ho bravado glory-of-war propaganda childhood indoctrination comics, Charlerys' War captured the horror of war without compromise. The sad truth is the WW2 strips don't compare, as pat mills was not awarded his budget required. For the WW1 story he interviewed veterans - the stories in that strip are TRUE. Fleetway couldn't / wouldn't give him the money he needed to do the same for WW2, so he walked, the strip was handed to a guest writer and although the story is based on factual events, the characters become fantasy. I have no idea how much Joe based his likenesses on actual people, but every single one of the characters in the non-Pat Mills books is full of life right up until... It's epic stuff, it should be reprinted in full. 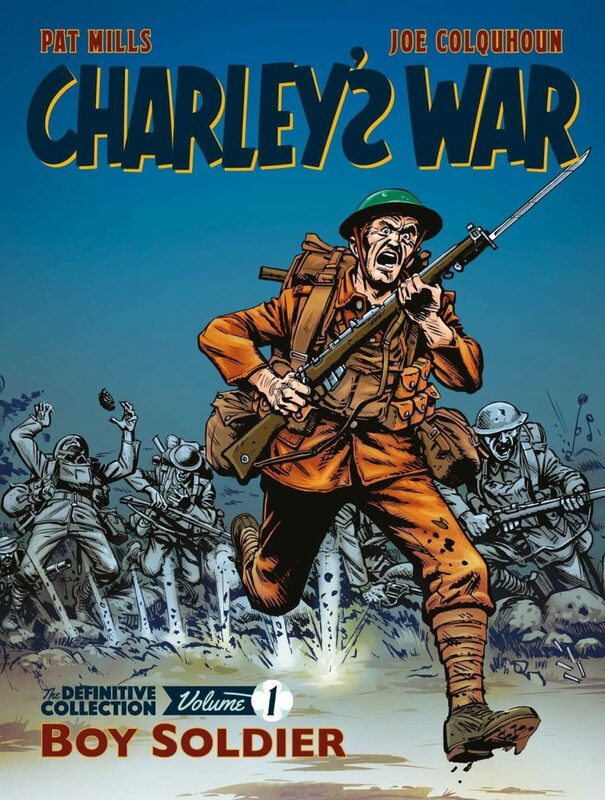 Over the last few years Moose Harris and I have maintained the semi-official Charley’s War web site, originally established by Neil Emery, which helped generate enough renewed interest in the World War One comic strip by Pat Mills and Joe Colquhoun to persuade Titan Books to reprint it. In 2015, hosting problems with the site meant I had to reluctantly make the decision to import its postings and features to downthetubes to ensure its survival. I hope you’ll find the pages now gathered here about Charley’s War and other war comics of interest. Appears Moose and Freeman are in bed with Rebellion for the new Charley's War editions. Oh, and Mills too. No laments here for "...royalties gone by, I (and my-friend-who-I-never-met's estate) miss them so..."
NEW CHARLEY’S WAR COLLECTION: BRAVO, REBELLION! Rebellion have done an absolutely brilliant job on the new Charley’s War series. This really is the definitive edition. Everyone concerned must have put a helluva lot of work into it; so my sincere thanks to all those concerned. I know many (maybe all?) the pages were rescanned, so special thanks to Moose Harris who I believe was at the heart of that operation and John Freeman of Down the Tubes for being so supportive of Charley all these years. The detail and the passion in the book is absolutely mesmerising and it’s now seen in its full glory. And with colour pages, too. Line-work that was hitherto blurred is sharply defined. It’s hard to believe the UK comic industry, with all the wretched obstructions thrown in our path over the decades, can foster an artist like Joe who has produced such a masterpiece. I hope his genius gets the further acknowledgement it deserves. I’ve been saying since the early days of Charley’s War that he is Britain’s greatest comic artist and this new edition surely proves it. It’s so powerful, it’s going to be a while before I will be able to look at it properly because tears come to my eyes, not just for Joe and for the story, but also for the reality of the Great War, which has been shamefully covered up by our rulers in these centenary years. A subject I’ve written about and lectured on elsewhere. I daren’t linger on it here, or turn the pages of the book because it will just remind me how our forefathers were betrayed by organised murderers and war criminals and how their memory is still betrayed today. See, for example, Harry Patch, the last Tommy, and his words on the subject. One further element had me in tears. The red poppy, which has been hijacked by our jingoistic militarist rulers as a symbol of supposed patriotism – and featured on the Titan covers despite my reservations – is now replaced by the white poppy. At last! I couldn’t believe it at first. We are living in an age where all establishment outlets downplay or don’t feature the anti-war movement in the Great War. For example, the British Library bookshop had not one book on conscientious objectors in sight when I checked. Yet the movement was so much stronger than our lying ‘historians’ (who are little better than government shills, and have literally taken the King’s Shilling with their fake histories) will have you believe. It is so heart-warming to see this symbol of peace – and not war – on Charley’s War. Bravo, Rebellion. You have done me and Joe proud. Thank you, guys. As some of the original art scanned by Moose for the later Titan editions was sold last year it would be interesting to know whether Rebellion scanned pre-sale by the Colquhoun family. John Freeman's own post doesn't mention any involvement. Considered by many as the most important war story to appear in comics, a new definitive collection of Charley’s War to mark the centenary of the end of the World War One leads the 2018 schedule from Rebellion’s Treasury of British Comics. Celebrating a year since its launch in June 2017, the Treasury of British Comics continues its mission to bring some of the classic British of the 1970s and ‘80s comics back into print. Deeply affecting, unsparingly hard, and unflinchingly political, Charley’s War follows a sixteen-year-old working class lad who eagerly signs up in 1916 but has his idealism quickly shattered in the hellish world of trench warfare where every day is a bitter fight for survival. A must for every book shelf and school library, this all-time classic of the medium features bold writing from Pat Mills (Nemesis the Warlock, Marshal Law) and breath-taking artwork from Joe Colquhoun. The first of three omnibus volumes will be released in April, with the next volumes due for release in May and June.